Making documents available to a group of users with all revisions of these documents, is a key task of projects and business processes of any kind. If this task must be performed in an auditable manner and the documents must be protected against access from third parties, then regibox is the right choice. The creator of an individual regibox creates it by push of a button, electronically invites the members und assigns user rights. Upon acceptance of such invitation, the user will be admitted to this regibox and in addition to receiving online web access, the user may also choose to automatically replicate parts of the regibox or the regibox as a whole onto his own infrastructure, from smartphone to server. Every regibox will be automatically registered by a trusted, independent third party in an auditable manner as is required for business purposes. One of the most criticized facts about cloud services is the lack of security of stored data. In order to make sure that your regibox data is always secured, regibox does encryption and decryption on the fly so that the regify provider, who hosts the data, is not even able to peek into your files. 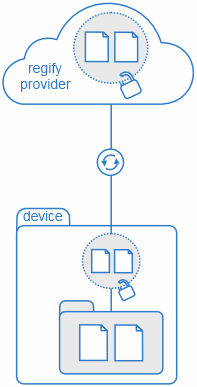 All data stored by the regify provider is encrypted with a unique regibox-key. The regify provider cannot access the contents and does not even know the file names. Everything you add, change or delete is automatically synchronized to your regibox. The transmission is always secured. regibox encryption and decryption is processed automatically on the client side (PC or mobile device). The software creates a regibox folder inside your standard "Documents" folder. Everything inside is part of your regibox(es). This means that you can do all those regular tasks like create, copy, paste, move, change and delete your files and sub-folders, as part of your normal workflow. All regibox related tasks such as invitations, restoring files and versions, can be done using your regibox manager . End-to-end encryption using AES256 industry standard encryption. Local file system integration (work in your standard local file system explorer). Automatic synchronization between central and local data whenever online. Working offline (accessing, adding or changing files while being offline). Invite users to become members of your regibox(es) (multi-level permission control). Secure invitation process using the patented regimail system (thereby eliminating man-in-the-middle and other security risks). Optional strong user authentication using two factor authentication. Comprehensive permission and user management during lifetime of your regibox(es). Publish option for selected files in order to give external parties access without them having to register or install software (ad hoc). Your regify account lets you access all regiboxes which you are a member of or which you created yourself. As a user of regibox and other regify services, you benefit from networked collaboration and communication with users, independent of which regify-provider they use. Automatic file integrity check by using SHA 256 algorithm on individual file level. Auditable file and user management with file version history (user/date/time) and regibox history (invitations, regibox creation). Comprehensive file versioning system including complete restore of previous versions. Recovery of deleted files and versions. Individual setup of regibox sizes and number by your regibox provider (regify provider). Available on all major platforms: Windows, Mac OSX, Linux, Android and iOS. Comprehensive system management: users, security, storage, availability or redundancy. Flexibility and process integration using the regify Software Development Kits (SDKs). 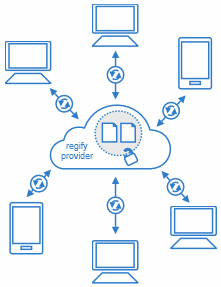 Bundles with other regify products regimail, regichat, regipay or regibill (one regify account for multiple products). regibox is also available as command line version. This version runs as service (Windows) or daemon (Linux) without GUI and allows to execute many functions directly via command line (e.g. create new regiboxes, invite users etc. ).